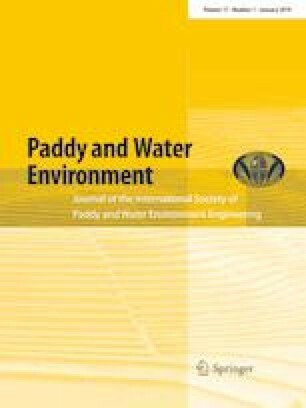 The national-scale variations and regional characteristics of the stable isotopic compositions of irrigation ponds, which are small reservoirs for irrigating paddy rice fields and play an important role in supporting rice production in Japan, and spring waters were investigated during irrigation periods for paddy rice. The isotopic compositions of spring waters are mainly affected by geographical factors (latitude and altitude) and meteorological factors (annual precipitation and ratio of winter precipitation to annual precipitation). In particular, the ratio of winter precipitation characterizes the spatial variations of the isotopic compositions on different ocean sides of the archipelago. The isotopic compositions of irrigation-pond waters are affected by meteorological factors (air temperature, ratio of winter precipitation to annual precipitation and wind speed) and geometrical feature (water depth). The isotopic compositions of irrigation-pond waters with relatively short residence times show seasonal variations, reflecting seasonal differences in isotopic compositions of precipitation, whereas spring waters show temporally invariant isotopic compositions. In addition to the regional differences of this seasonal isotopic variation, irrigation-pond waters were affected by evaporative isotopic enrichment. These two elements influence the isotopic compositions of irrigation-pond waters across Japan, resulting in different values from spring waters. This study was supported by JSPS KAKENHI Grant Number JP15K18760.